Kmart Weekly Coupon Matchups - 11/1-11/7/15 SUPER DOUBLES WEEK! however it's the first five coupons scanned that will double. Make sure you hand the ones that you want doubled to the cashier first. A coupon will not double beyond the value of the item. 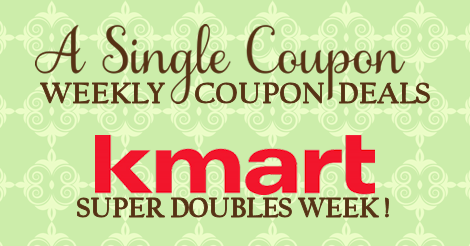 Kmart store coupons may be used however they will not double. Excludes Decaf, 29.3oz, and Wake Up Roast, 30.65oz. Includes: Special K, 11.2-13.1oz, Frosted Mini Wheats, 15.2-18oz, Raisin Bran, 18.2-18.7oz, Frosted Flakes, 15oz, or Kashi, 13.1-14oz. Excludes Suave Professionals or Men's Heritage Classic Body Wash.
Members get $5 off instantly wyb $25. Limit 2 per transaction.